What does it mean that six schools work together to create the IMM Global EMBA program? One of the IMM program’s advantages is that sixleading schools pool their resources to provide a unique, global experience. Each of the partners (Purdue, TIAS, FGV-Rio, MIP, ISM, and Tianjin) is responsible for the residencies at their school and also share responsibility for residencies in other locations. Each school is involved in recruiting, resulting in a geographically diverse cohort. 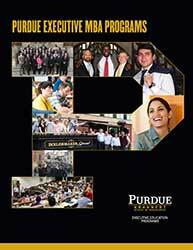 Another feature is that each graduate earns a Purdue MBA and an MBA from TIAS. The six schools represent some of the most competitive elements of the global economy: the EU, the U.S., and emerging markets. Each school is a leading institution in its respective region. We target applicants in mid to senior levels in their company to ensure a strong foundation to learn not only from the faculty, but from peers as well. The TOEFL and GMAT exams can be waived based on other elements of your background such as your work experience and education. The program costs $85,000 USD. This covers tuition, lodging during all the residencies, most meals, class materials, books/ebooks, company visits, networking/social events and more. The primary expense for you would be travel to and from residencies. Payments may be spread out over five installments, about once every three months. The actual payment schedule is available from John Lewandowski (lewandow@purdue.edu). Scholarship decisions are made based on a complete review of application materials as well as the interview. As the amounts of the scholarships are provided on a rolling basis, it is to your advantage to apply as soon as possible. Questions regarding scholarships should be directed to Aldas Kriauciunas, Executive Director of Purdue EMBA Programs, at akriauci@purdue.edu or 765-496-1860. Yes, we require an in-person or virtual interview. Contact Aldas Kriauciunas, Executive Director of Purdue EMBA Programs, at akriauci@purdue.edu or 765-496-1860, to schedule an interview. We always welcome applicants to visit the classroom, since seeing the program in action is the best way to learn about the program. Often you will also have a chance to have lunch with the students and speak with them directly about your experiences. Please contact any of the partner schools for more information and to arrange a visit. After you submit your materials, the admissions office at Purdue University will confirm all items are in order. The materials are then provided to the Purdue graduate school, the central admissions authority, since all graduates receive a Purdue MBA. It generally takes two weeks from when all materials are properly submitted for final approval. The need for visas for the residencies varies by your citizenship. The school hosting a residency will issue the invitation letter needed for obtaining a visa in coordination with Purdue University. The program begins each March with a week-long orientation at Purdue University. This is a chance to meet your peers in the program, start on coursework, engage in team-building, and receive your eBooks. The faculty for each course provide a syllabus detailing all homework assignments for the 12-week module. Students complete these individual and team homework assignments per their own schedules—evenings and weekends—and submit electronically. This is expected to take about 20 hours per week, but students choose the time and still manage to complete work assignments for their company, and have time for their families. Most of the assignments are team-based and executed by diverse student teams using various online technologies. For some classes, there are also team-based and class-based online discussions. At the end of the module, all the students meet for a 13-day residency at a partner school. During the residency, students engage in interactive classes, company visits, and social events including cultural immersion. After the residency, the students have a week to prepare for online final examinations. After exams, there is typically a one week break and a new module begins with new study teams. Incoming classes have approximately 25 students. Less than half are from the U.S., about one-quarter from Europe, and the rest from South America, Africa, and Asia. One-third have an engineering background and one-third have a management/business background. The work experience ranges from five years to almost 30 years, with an average of 15 years. They are all hard-working individuals like you, who believe an Executive MBA will provide them with more, and more global, opportunities. Many have families and are also balancing work-home-school demands. Our participants tend to be experienced decision-makers with current or expected responsibilities in the global arena. They manage people, lead teams, and run divisions or companies. You will be assigned to work with a group of your peers. The groups will be changed each module to ensure that you have an opportunity to meet and work with a wide range of your colleagues. The groups are arranged by the program and are balanced by geographic region, industry background, and functional skills to allow for the development of innovative solutions to challenging problems. Some of the assignments are done individually and some are done in groups. The professor’s syllabus will always provide details on these points. One of the great advantages of the program is that for each residency, classes meet in a new location. Currently, the general order of locations is: Orientation/Launch Week (Purdue), Residency 1 (TIAS/The Netherlands), Residency 2 (Vilnius, Lithuania and MIP/Milan, Italy), Residency 3 (FGV-Rio/Brazil and Santiago, Chile), Residency 4 (Purdue), Residency 5 (Shanghai, Tianjin, Beijing in China), Graduation (Purdue and TIAS). Students have individual hotel rooms during residencies and almost always are within walking distance of the class locations. If walking is not possible, transportation if arranged. The IMM Global EMBA program offers a comprehensive career management component. First, you can interact with an Executive Career Coach who will help you leverage the MBA to achieve your career goals. Second, you will have access to a career counselor at Purdue University who is available by phone, email, or in-person to discuss career management ideas and direct you to appropriate resources. Third, you have access to the Purdue Career Wiki which is a comprehensive, online resource consisting of career guides, company/industry databases, and business news. Fourth, courses within the curriculum (e.g., Organizational Behavior, Leadership) complement your career management development skills. Finally, on-campus events such as networking receptions and dinners solidify career management opportunities.